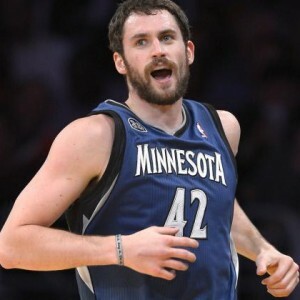 CLEVELAND – The Cleveland Cavaliers have acquired forward Kevin Love in a three-team trade that sends guard Andrew Wiggins and forward Anthony Bennett to Minnesota and a protected 2015 first round pick (via Miami) to Philadelphia, General Manager David Griffin announced today from Cleveland Clinic Courts. As part of the three-team trade, Minnesota will also acquire forward Thaddeus Young from the 76ers, while Philadelphia receives forward Luc Mbah a Moute and guard Alexey Shved from the Timberwolves. Voted as a starter for the Western Conference in the 2014 NBA All-Star Game, Love appeared in 77 games (all starts) for Minnesota last season and averaged a career-high 26.1 points on .457 shooting, including .376 from beyond the arc and .821 from the foul line, 12.5 rebounds and a career-high 4.4 assists in 36.3 minutes per game. Among NBA leaders, the 6-10, 243-pound forward ranked first in double-doubles (65), first in defensive rebounds per game (9.6), third in total rebounds per game (12.5), fourth in points per game (26.1), tied for fourth in triple-doubles (3) and tied for eighth in three-pointers made (190). In 2013-14, Love became the first player in NBA history to record 2,000 points, 900 rebounds and 100 three-pointers in a single season, while also setting Minnesota’s franchise record for three-pointers made in a season, points per game, and free throws made (520) and attempted (633). Love is the first player to average 26/12/4 over a full season since the NBA/ABA merger as Kareem Abdul-Jabbar and Bob McAdoo had most recently accomplished that feat in 1975-76. He also scored in double figures in all 77 games last season, which includes 57 games with at least 20 points, a Wolves’ franchise record 25 30-point games and six 40-point performances. He collected a league-leading 24 contests with at least 20 points, 10 rebounds and five assists, and possessed the third highest PER in the NBA at 26.97, behind only Kevin Durant (29.90) and LeBron James (29.40). Over his six-year NBA career, Love has played in 364 games (282 starts) for the Timberwolves and owns career averages of 19.2 points, 12.2 rebounds and 2.5 assists in 36.3 minutes per game. He is a three-time NBA All-Star (2011, 2012, 2014), two-time All-NBA Second Team selection (2012, 2014), Olympic gold medalist (2012) and winner of the league’s Most Improved Player award (2011) and Three-Point Shootout (2012). The UCLA product was selected to the All-Rookie Second Team in 2009 after being the 5th overall pick of the 2008 NBA Draft by the Memphis Grizzlies. He has averaged at least 14 points and 11 rebounds in five of his six NBA seasons and since entering the league, his 12.2 rebounds per game is the second-highest in the NBA (Dwight Howard, 13.3). Since 1980-81, Love is one of only three players to have at least two seasons with 26.0 points and 12.5 rebounds (2011-12, 2013-14), joining Shaquille O’Neal (4) and Moses Malone (2). 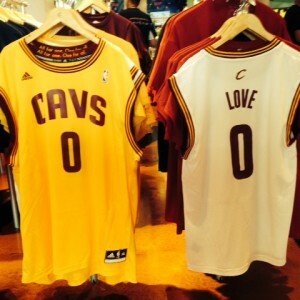 Love will wear #0 with the Cavs. 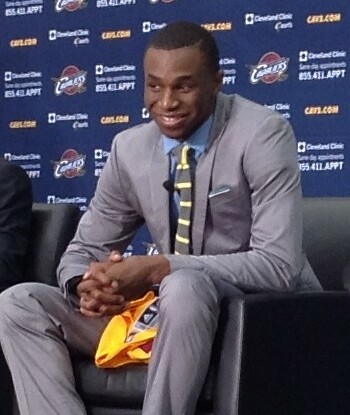 Wiggins was the first overall pick by the Cavaliers in this year’s NBA Draft. An early entry candidate from Kansas University, Wiggins, 19, was named Big 12 Freshman of the Year and First-Team All-League in his only year at Kansas. In 35 contests with the Jayhawks last year, the 6-8, 194-pound guard averaged 17.1 points, 5.9 rebounds, 1.2 steals and 1.0 block in 32.8 minutes per game. In four games during the 2014 NBA Summer League, Wiggins averaged 15.5 points, 3.5 rebounds, 1.3 steals and 1.5 blocks in 29.9 minutes per game. 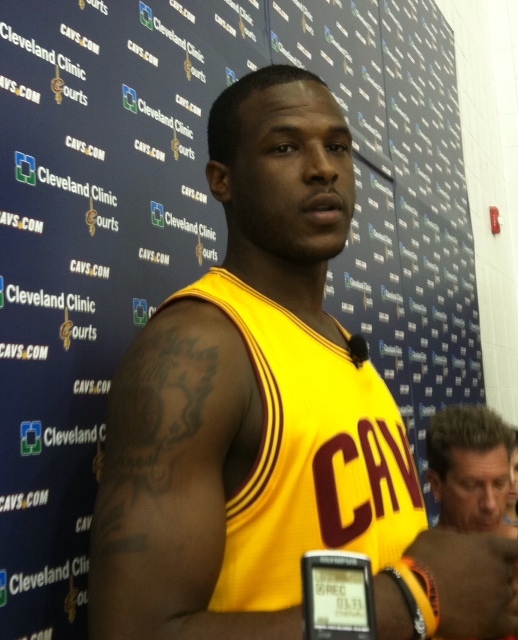 Bennett was the Cavs’ No. 1 pick in the 2013 NBA Draft, appearing in 52 games and averaging 4.2 points and 3.0 rebounds in 12.8 minutes per game in 2013-14. The 6-8, 243-pound forward out of UNLV also played in four contests for the Cavs’ summer league team with averages of 13.3 points and 7.8 rebounds in 29.8 minutes per game. 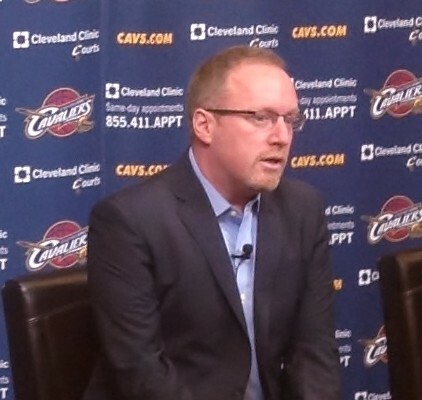 The Cavs will send Philadelphia a protected first round pick in the 2015 NBA Draft. The pick was originally acquired from the Miami Heat and is pick 1-10 protected in 2015 and 2016. The pick becomes unprotected in 2017. So what happens when Love comes to town? The Cavaliers are hoping it leads to an NBA championship one day soon. U2 and B.B King sang about it years ago. Everybody else has been talking about it recently. 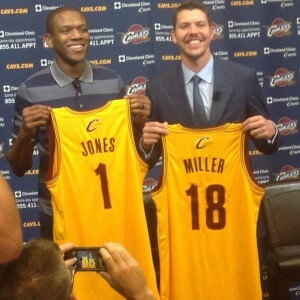 And now the biggest trade in the NBA this off season finally happened. Love is coming to town. Cleveland has acquired Kevin Love from Minnesota for this year’s first overall pick, Andrew Wiggins, last year’s #1 pick Anthony Bennett and a 2015 first round draft pick they acquired from Miami as part of the LeBron James trade back in 2010. Per ESPN.com and Yahoo Sports, the Timberwolves also get power forward Thaddeus Young from Philadelphia and a reported $6.3 million trade exception as part of this three team swap, and in turn will send Luc Mbah a Moute and Alexey Shved plus a first-round pick to the 76ers. 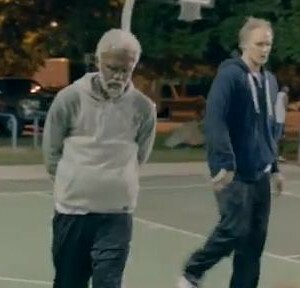 Love, just 25 years old, comes to Cleveland and gets to reunite with Olympic teammate LeBron James and street ball teammate “Uncle Drew”, Kyrie Irving. 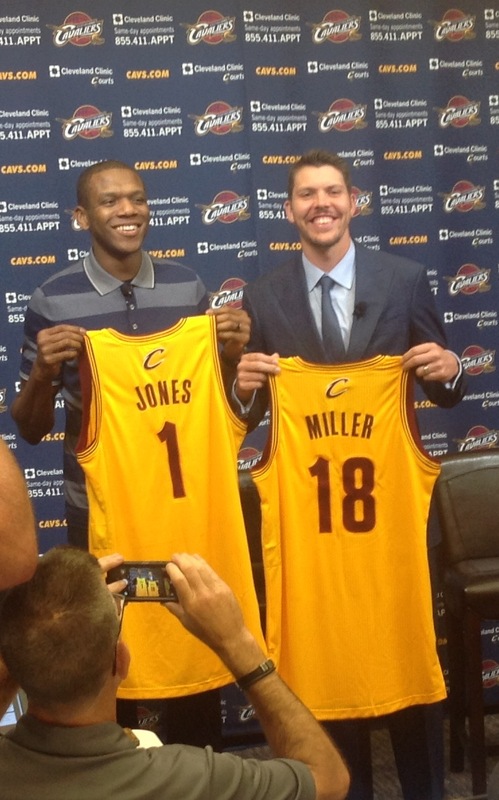 It creates a “Big 3” that Cleveland has been looking for since “King James” first tenure with the Cavaliers. Love averaged over 26 points per game along with 12 rebounds a game last season for the Timberwolves, while also dishing out over 4 assists per contest. 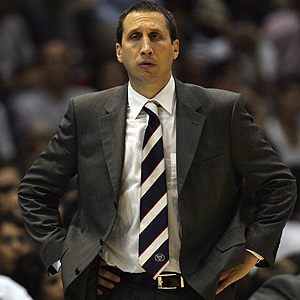 Love gives Cleveland three different 20 points per game scorers in David Blatt’s starting lineup which right now looks like Irving at the point, Dion Waiters at shooting guard, James at small forward, Love at power forward and Anderson Varejao at center. It’s no secret that LeBron James wanted Love in Cleveland as he spoke highly of his high basketball IQ and what a great teammate he was in the 2012 London Olympics at his recent homecoming party in Akron, Ohio. 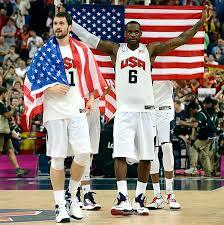 James and Love helped Team USA win the gold medal in London. On the flipside, James never spoke to, or about Andrew Wiggins, and didn’t mention him in his Sports Illustrated essay when he announced he was returning home to Cleveland. So the writing was on the wall that James had no problem with the Cavs dealing Wiggins, a possible future All-Star, for Love, already an All-Star 3 times over and a 2-Time All-NBA second teamer. For Wiggins, a kid with enormous potential, he finally gets to call someplace home as he goes to Minnesota and will be the focal point in their rebuilding process. Bennett will get a fresh start with the T-Wolves after having a disastrous rookie season a year ago, after he was selected first overall. Love can opt out of his contract and be a free agent at the end of the 2014-15 season and like LeBron James, will probably do so. It will allow Love and James to take advantage of getting a max deal worth max dollars after a new TV contract is expected to be signed by the NBA, which would then raise the league’s salary cap and max free agents will be able to make more money on those deals. 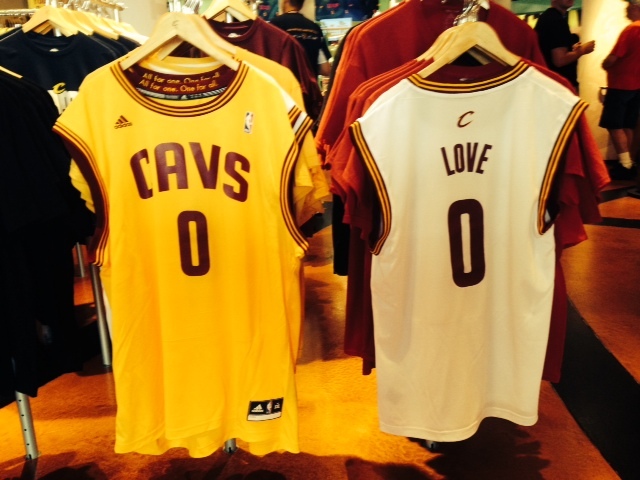 Love will wear the number #0 and you can already buy his jersey at the Cavaliers Team Shop at Quicken Loans Arena. A press conference to introduce Love to the media will be held on Tuesday, August 26th at 3pm at Cleveland Clinic Courts. With Timberwolves owner Glen Taylor coming out and saying it not a matter of “if” but “when” Kevin Love would be traded, it was no surprise that various media outlets today reported that the T-Wolves and Cavs have a handshake deal in place. 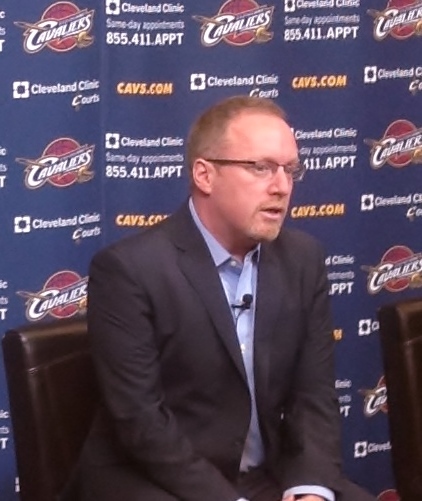 It can’t officially be announced until August 23rd at the earliest because of NBA rookie contract rules, but the deal centers around sending Love to Cleveland, rookie number #1 overall pick Andrew Wiggins to Minnesota and it also involves Anthony Bennett of the Cavs, maybe some other minor players and a 1st round draft pick, or picks. Should the trade that everyone believes will happen between the Cavs and Timberwolves involving Kevin Love and Andrew Wiggins go down, here’s a look at what the Cavaliers roster could look like on opening night. I’ve added a pair of free agents who have yet to sign with anybody, but are rumored to be seriously considering the Cavs in Shawn Marion and Ray Allen. 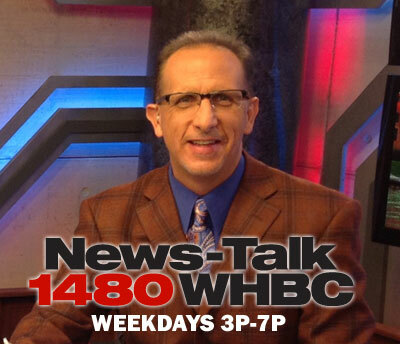 Cavaliers beat reporter Rick Noland from the Medina Gazette joins me to talk about Mike Miller and James Jones joining LeBron James in Cleveland and when the Cavs trade for Kevin Love does that make them the favorites in the Eastern Conference? 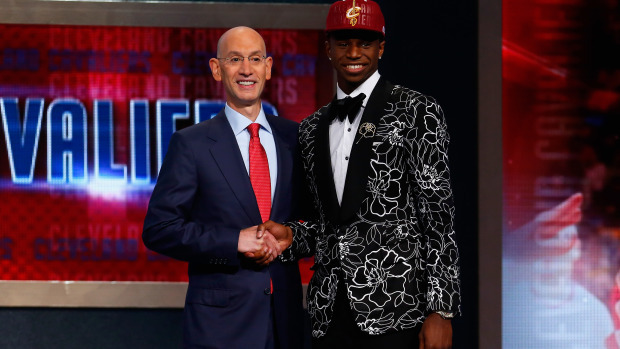 The countdown continues as to whether or not Andrew Wiggins remains a Cleveland Cavalier. 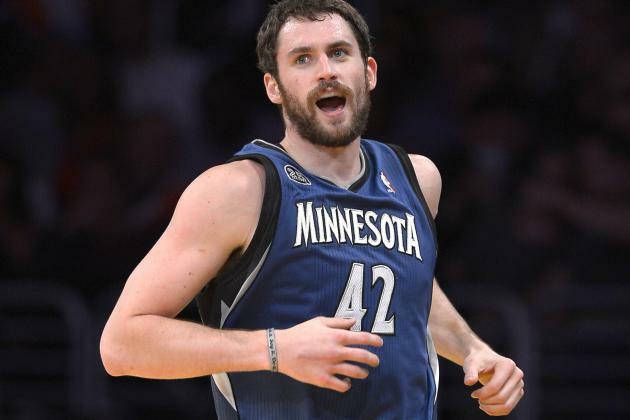 The NBA’s number #1 overall pick has been mentioned in trade rumors involving a potential deal with the Minnesota Timberwolves for Kevin Love since he put his autograph on his contract on July 24th. Per NBA rules, after signing a rookie, a team must wait 30 days before it can trade him to another team. 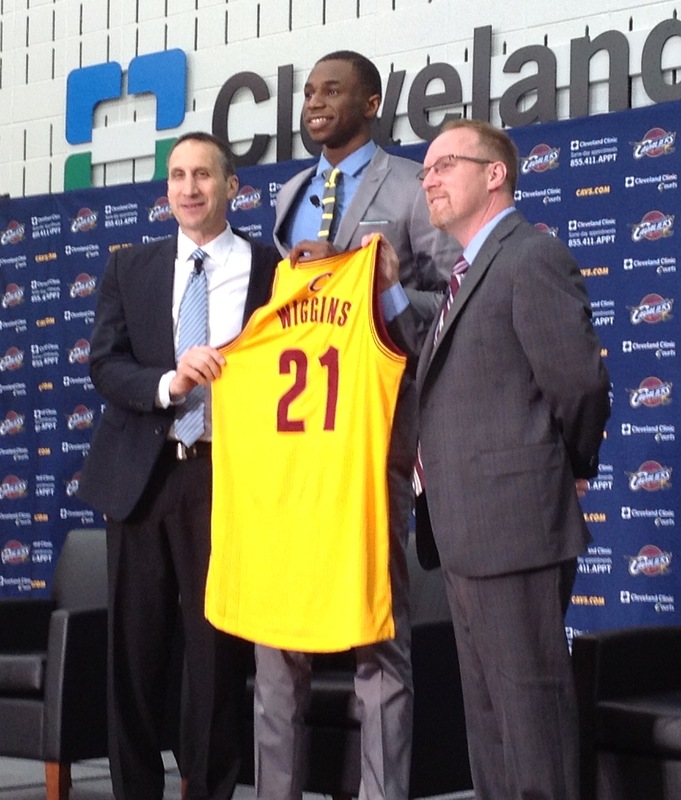 The first day the Cavs could officially deal Wiggins, who they inked to a 4-year contract, is August 23rd. The latest rumor has Wiggins along with Anthony Bennett and other players, plus at least one Cavs future first round draft pick going to Minnesota for Kevin Love. 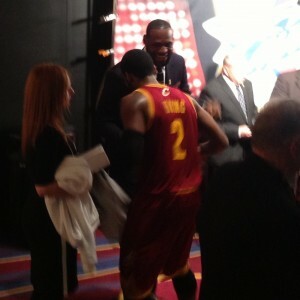 Love who is 25, is a 3-time All-Star and 2-time All-NBA second teamer. He played with LeBron James on Team USA at the 2012 London Olympics where the two won gold. He can be a free agent at the end of the 2014-15 season, so the Cavs would be rolling the dice a little on giving up so much for a player who could walk after one season. However, if Cavs G.M. David Griffin were to pull off such a deal, I’ve got to believe that Griff and the organization feel strongly that they will be able keep Love along with James by signing both to max contracts. So the wait and rumors continue. August 23rd can’t get here soon enough for all the parties involved. Isn’t that the truth for the Cleveland Cavaliers. 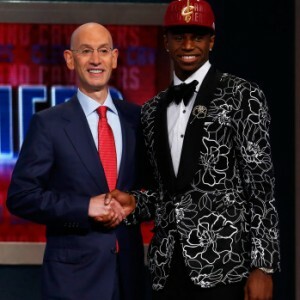 After signing Andrew Wiggins, the number #1 overall pick in this year’s NBA draft yesterday, the Cavs will have to wait until August 23rd at the earliest, in order to add Love, as in Kevin Love, to their roster and maybe ease the mind of LeBron James. Due to NBA rules, the Cavs cannot trade Wiggins for 30 days after the signing of his rookie contract. 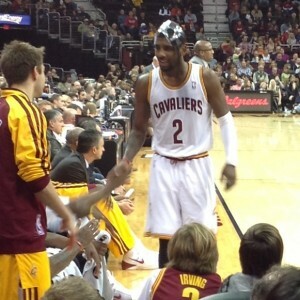 So LeBron, Cavs G.M. David Griffin, T-Wolves head honcho Flip Saunders and NBA fans everywhere will have to wait and see if the most talked about trade this off season will come to fruition. 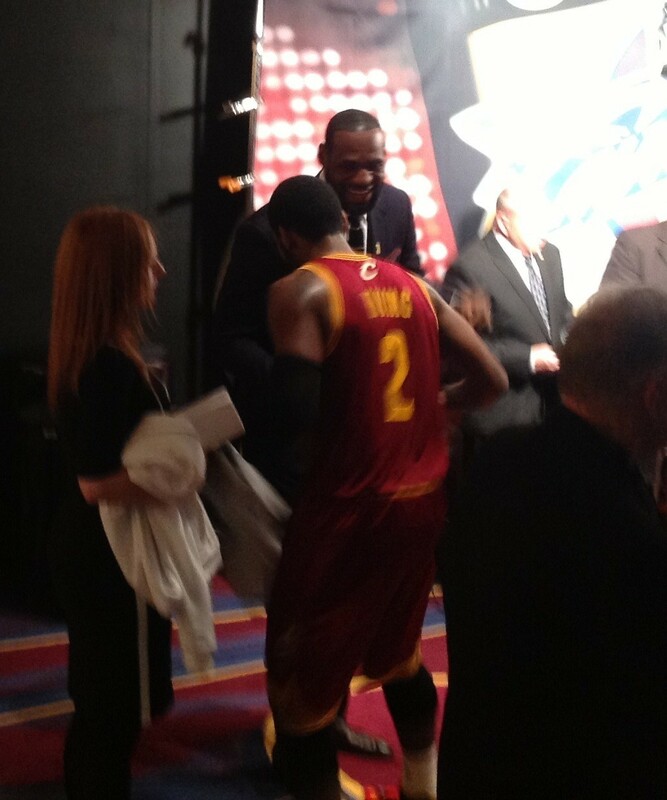 If it does happen, will it be with the Cavs and will Wiggins will be in the deal? If not the Cavs, then does Love go to Chicago or Golden State and for whom? Let’s say the Cavaliers end up winning the Kevin Love sweepstakes and it costs them Andrew Wiggins, Anthony Bennett and at least one first round draft pick along with other players/contracts(that’s the rumored deal that’s out there now). With Love on the roster it would make the Cavaliers starting line-up arguably one of the best, if not the best starting line-up in the NBA. 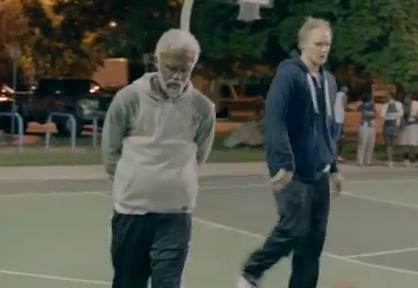 But what would it do to the Cavaliers depth this season and in the future? Here are the potential Cavs line-ups and depth charts with Love and without Love. You decide which roster you’d prefer to have. Take your time in making your decision on which roster you would prefer because David Griffin and the Cavs can’t do anything for another month. 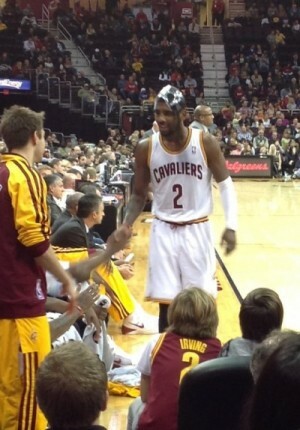 As much as they would like to hurry Love to Cleveland, there’s still a lot of give and take that has to happen. 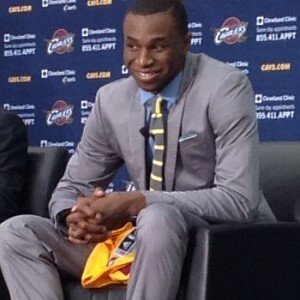 ANDREW WIGGINS SIGNS WITH CAVS, BUT WILL HE STAY WITH CAVS? 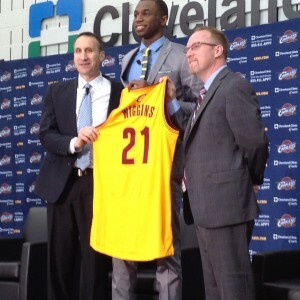 The Cleveland Cavaliers made it official today, signing Andrew Wiggins, the first overall pick in the 2014 NBA Draft. 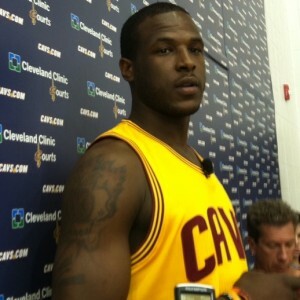 The 6’8, 200 pound swingman was chosen by Cavs G.M. David Griffin over Jabari Parker and his Jayhawhks teammate Joel Embiid. Wiggins left after his freshman year at Kansas where he averaged 17.1ppg and 5.9rpg. In 4 games for the Cavs in the Las Vegas Summer League, Wiggins averaged 15.5ppg. By signing Wiggins today the Cavaliers are unable to trade the talented rookie for 30 days, as they continue to explore the possibility of dealing for Timberwolves power forward Kevin Love. Minnesota part owner, president and head coach Flip Saunders has made it clear that if the Cavs want Love, Wiggins must be the centerpiece of the deal. There have been varying reports on whether or not the Cavaliers are willing to part with Wiggins. If they do, his salary of $5.5 million for his rookie season will now count as part of the deal since he has officially signed his contract, but any trade involving Wiggins can’t officially happen now for 30 days. The Chicago Bulls and Golden State Warriors are also reportedly interested in trading for Kevin Love. Per ESPN’s Brian Windhorst the Cavs have also signed 2nd round pick, shooting guard Joe Harris out of Virginia to a 3-year, $2.75 million dollar contract.